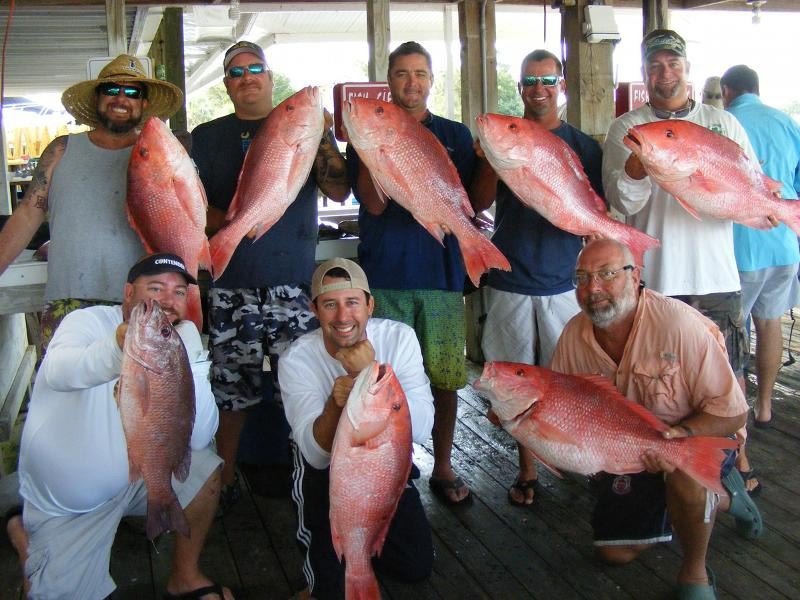 While it started off slowly, red snapper season was a great success, as you can see from the many fine catches in the photos. 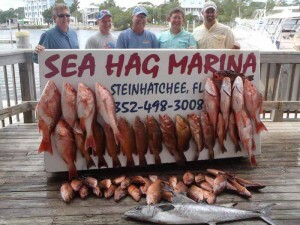 Although it lasted only a month, the season provided a great opportunity to collect some great eating with both red grouper and red snapper open. Kingfish finally made it into the area with a bang; there have been some massive fish taken, including a new record-setting kingfish for the Gainesville Offshore Fishing Club. 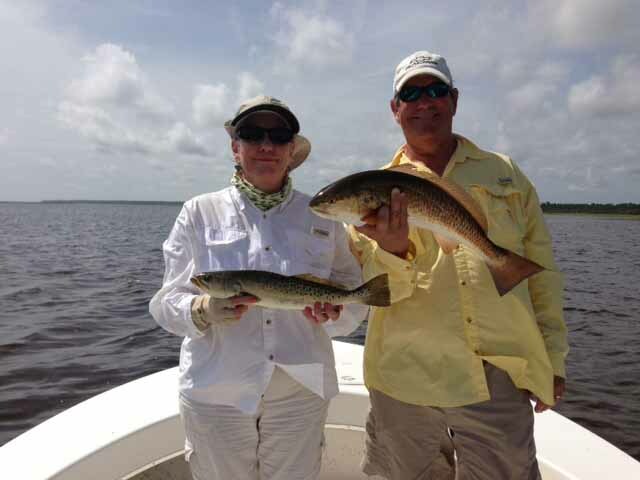 Inshore the trout fishing was as good as ever, with some very large catches, and the redfish seemed to be everywhere; unfortunately, many were over slot sized. 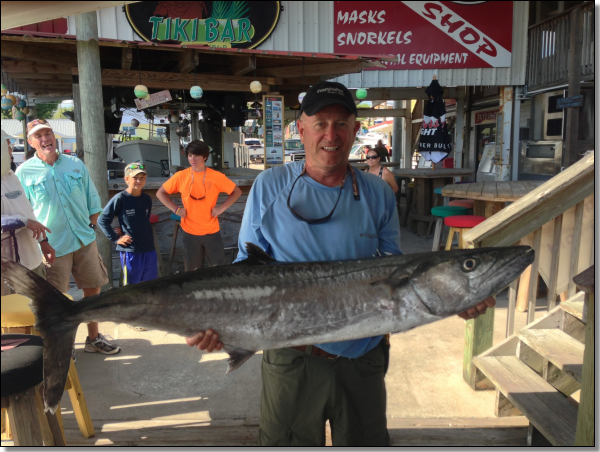 Several tournaments were held this month, including the Doug Johnson Reeling for Kids tournament, and the Nauti-Girls tournament. 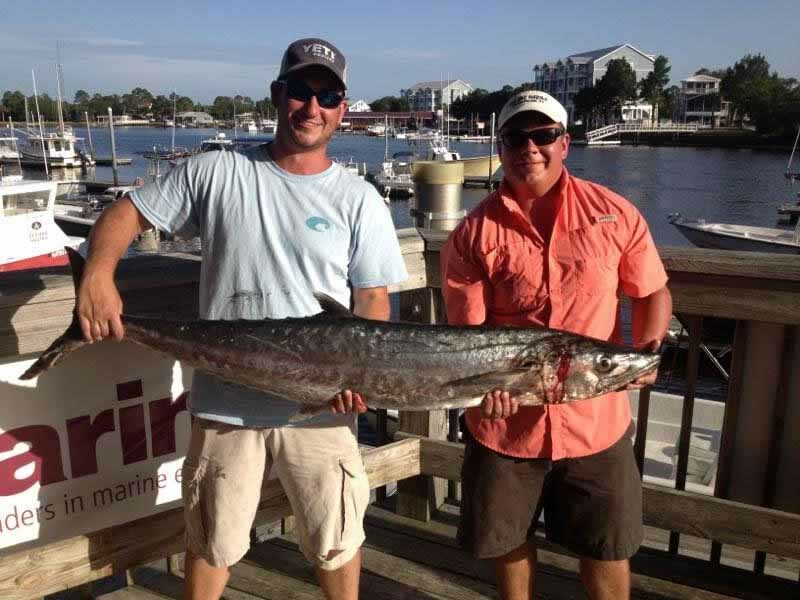 Spanish mackerel were a little more scarce than usual, and cobia moved a little further offshore to deeper structure. 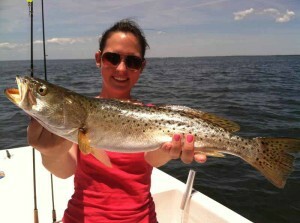 Here are some pictures of a few of this month’s best catches. Can you say “scallops”? At the very end of the month, FWC agreed to open scallop season a few days earlier, which turned out to be an excellent move. 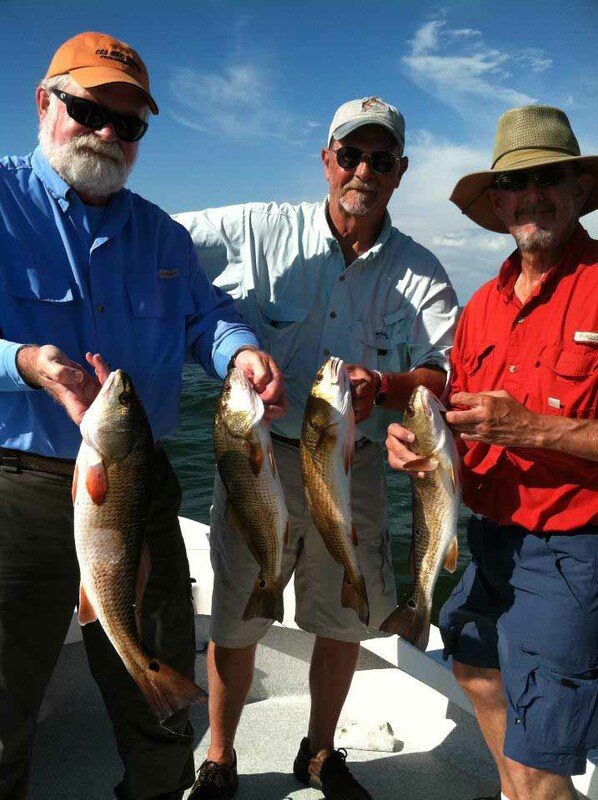 The picture below was taken on opening day, June 29, with a limit collected in clear water in a bit over an hour, so the scallops are here and waiting for you. 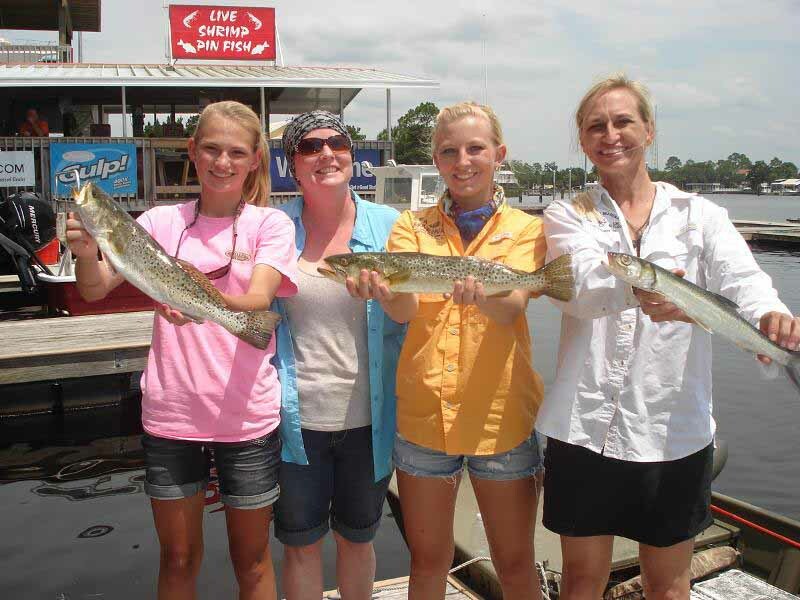 For a brief overview about scalloping in our area, go to our scalloping webpage. It looks to be a much improved season over last year. We have seen lots of scallops in the clear shallows near Big Grass Island, but they will be found in lots of other places as well. 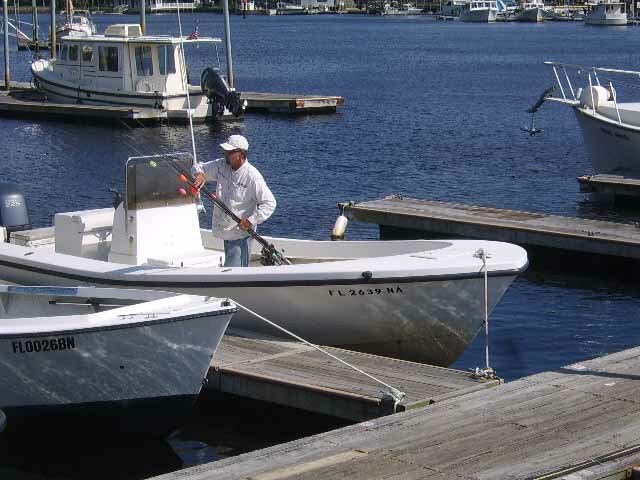 If you are familiar with our scallop season, you know that accommodations are hard to find, but it’s always worth a call to our marina to see if any of our newly renovated cottages are available. 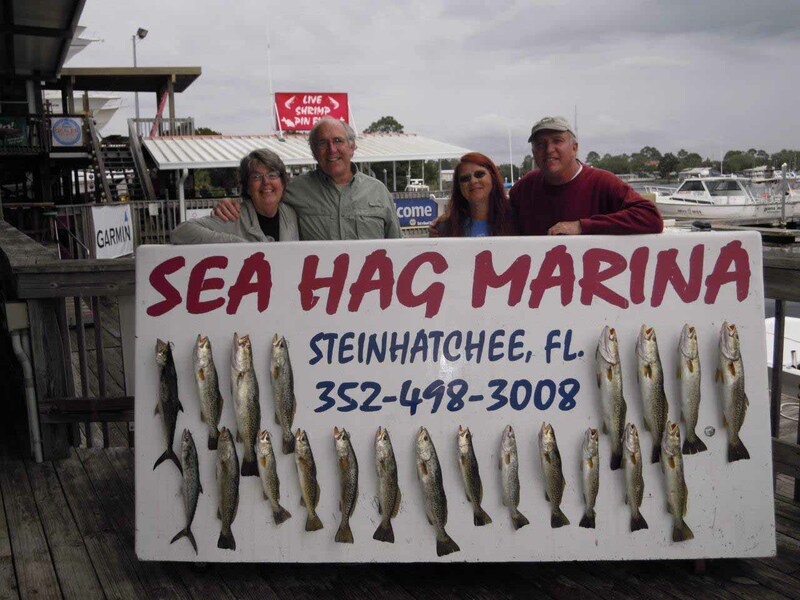 Scalloping is a great family experience, and if you’ve never done it, this is your chance; most of our guides, both inshore and offshore, will do scallop trips, and another option is to take your family and friends on one of the Sea Hag’s fleet of rental boats for a day or more. 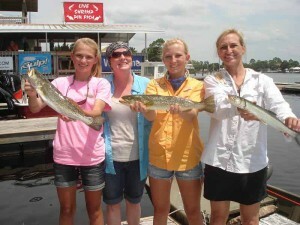 Rentals are very reasonably priced and you will get hints from the staff regarding where to go. Remember you must have a fishing license to collect scallops, which you can get at the Ship’s Store, along with everything else you need for scalloping, including dive flags, boat ladders, and dive equipment. 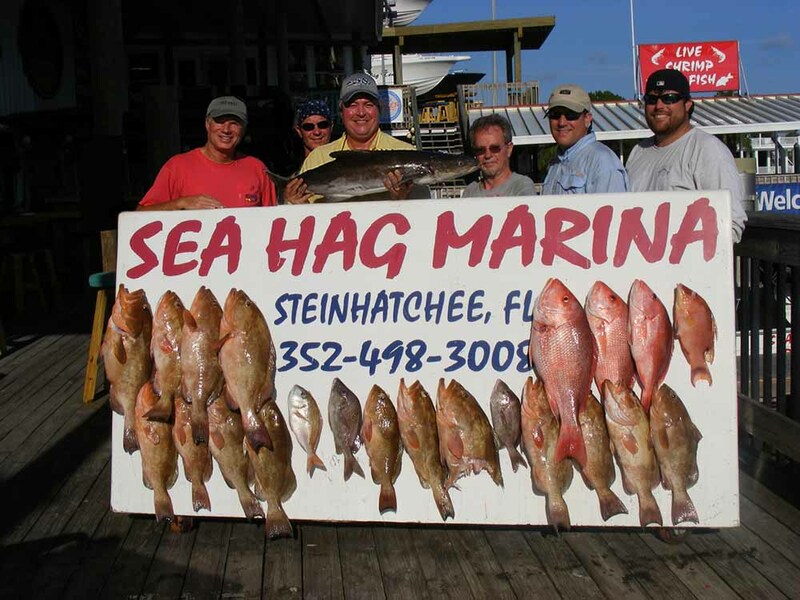 Fishing will continue to be excellent, although inshore fishing is best done between daybreak and mid-morning because of the large number of scallopers. Luckily, scallops rise in the water column with the sun and are more accessible around mid-day and the afternoon rather than earlier. Combining an early morning fishing trip with an afternoon scallop trip is the perfect way to spend a day this time of year. 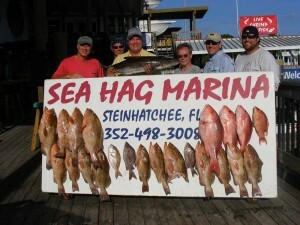 Offshore, red grouper are open season, and finally the federal season is open for our favorite, gag grouper. 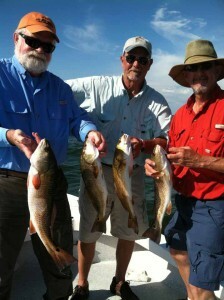 Four grouper per person can be taken, of which 2 can be gags. 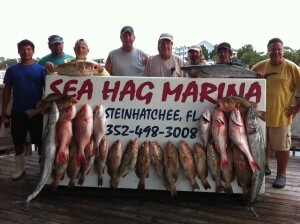 Gags must be at least 22 inches in length, red grouper at least 20 inches. 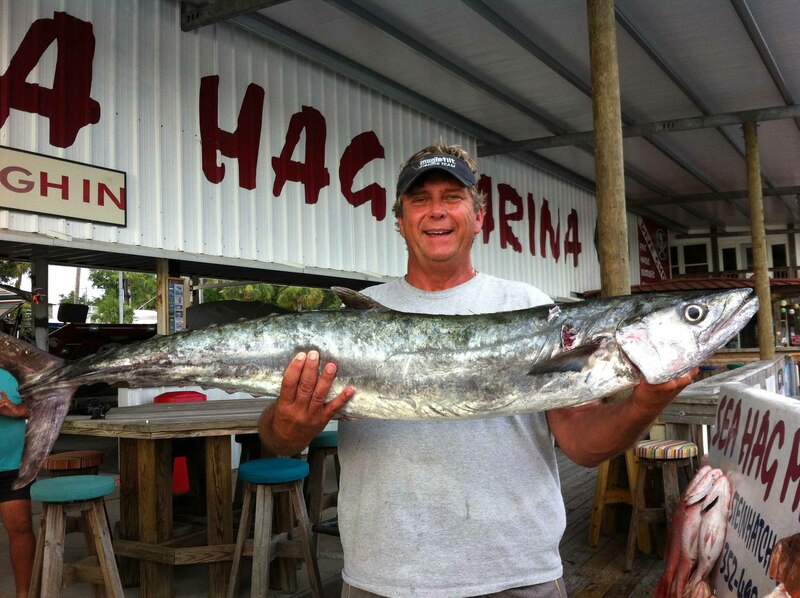 Kingfish will be around bait pods and over hard bottom; leaving a live bait to freeline while bottom fishing may result in some screaming drags from big smoker kingfish. 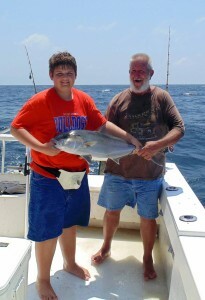 Amberjack are out of season until August 1 but will still provide plenty of action. In summary, the fishing will be great and the parties will be ongoing throughout the summer, so make sure you plan to join us. It’s the happiest time of the year. Thanks to our governor scallop season is opening 2 days early this year. The staff that work so hard at the Sea Hag must be going crazy with all the people calling, trying to change their reservations. 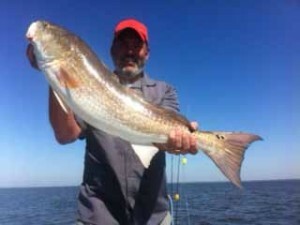 I was booked for fishing charters for this weekend so little matter to me. Speaking of fishing—the flats are still alive with trout. 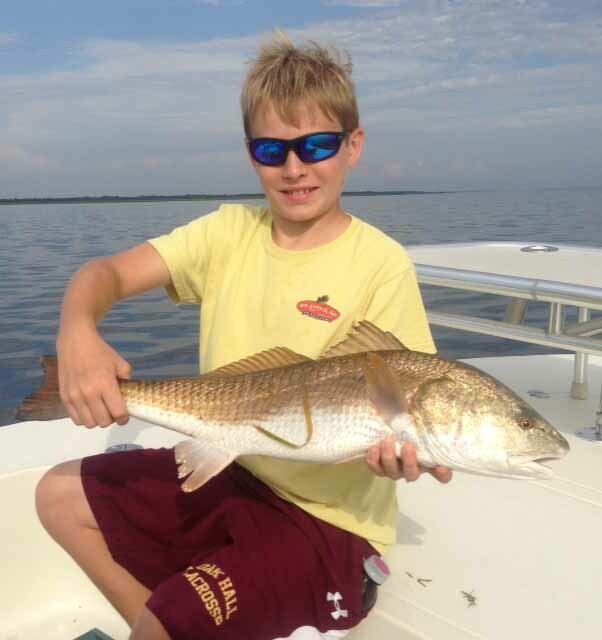 If you plan a fishing trip during scallop season, hit the shallows early before the scallopers wake up. After about 10 am move to deeper water. 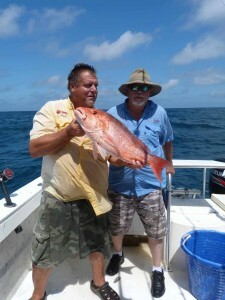 I’m still catching some nice reds in the shallows also, with the Pepperfish area best for targeting reds. 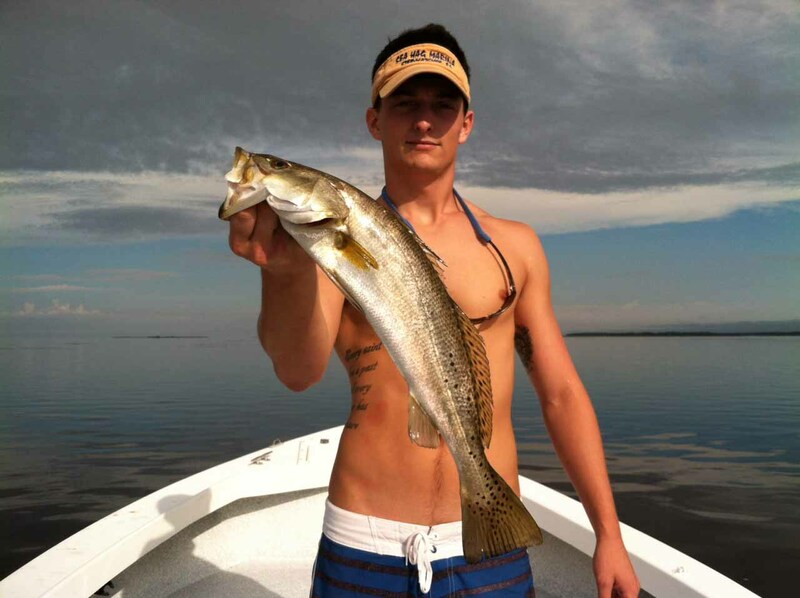 The trout are more plentiful to the north—but there are plenty south also. Sea bass in the keeper size are still slipping through the trap lines, which seem to be everywhere, but that’s where the crabs are. Still plenty of Spanish around the bars both north and south of the river and lots of sharks to be taken anywhere you stop. 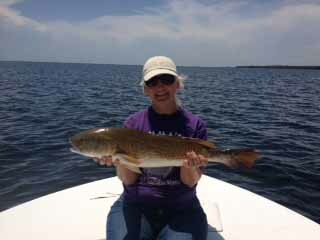 I still have a few days open for fishing this month—-call me if interested. 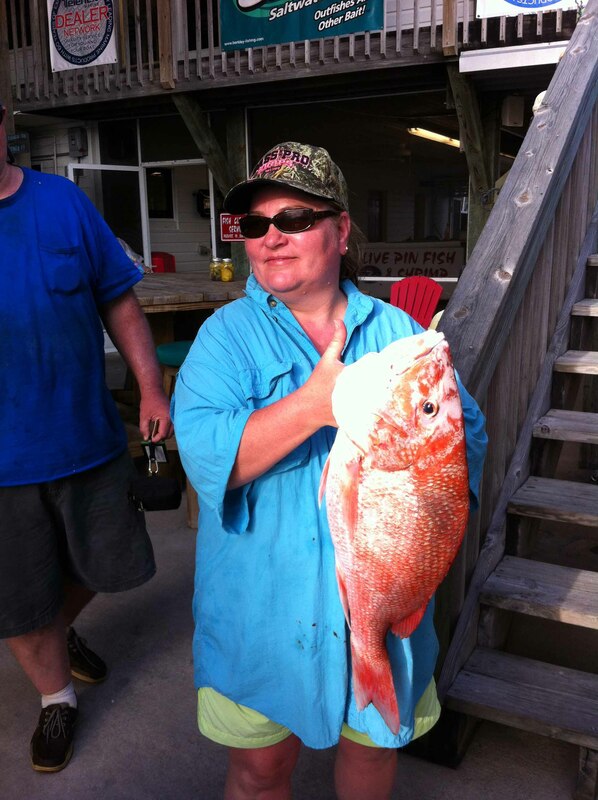 WE ALSO DO SCALLOP CHARTERS. 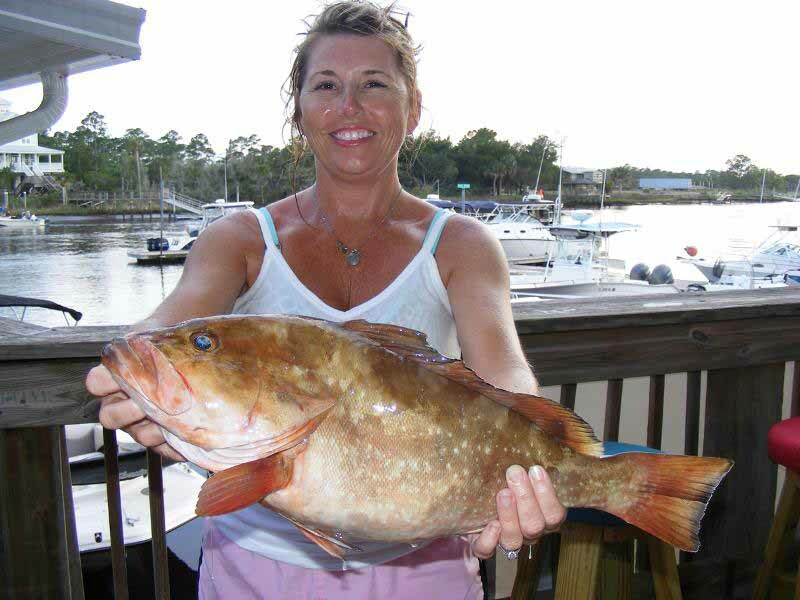 July is scallop season in Steinhatchee…but this year gag grouper season shares the same beginning date of July 1st. 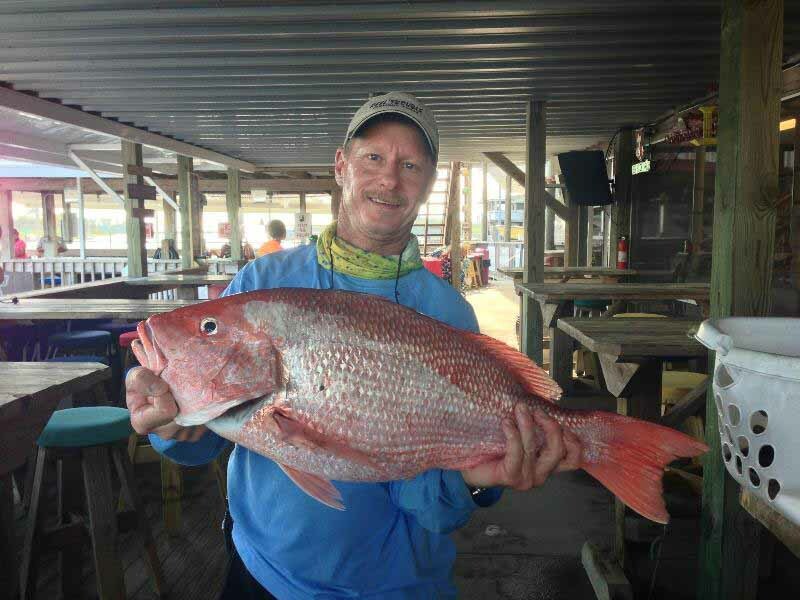 Red snapper are closed but should be available again in the fall depending on how the Gulf Council decides to allow harvesting the remaining recreational allocation. 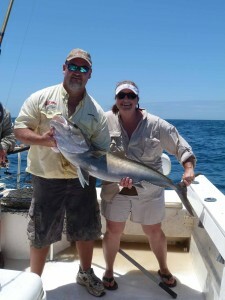 Kingfish and cobia have largely moved offshore and remain possible for the enterprising grouper angler. Some fine kingfish have been brought to the docks recently including the ones pictured. Since red grouper season began in April, it seems like we release a couple of limits of gags each trip so I am looking forward to finally being allowed to legally keep a few for customers. Hope to see you on the water in July! 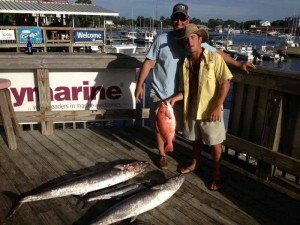 Folks, flexibility was the key word for fishing this month. 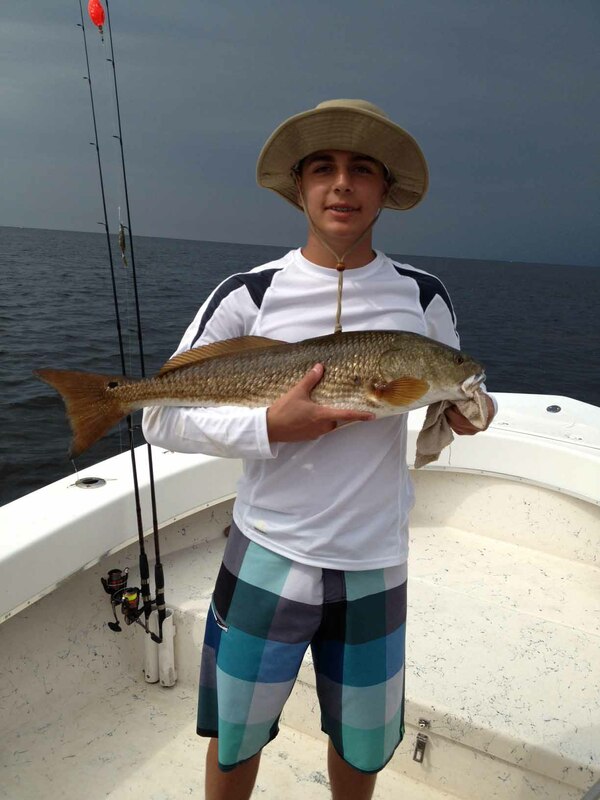 Showers were abundant but if you wait a while they will pass and you can pursue your favorite species. 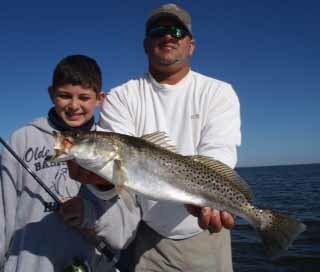 Trout are still biting well, although you may have to move around a bit at different depths to locate quality fish. Gulps are working well in the pink/white and chartreuse/white colors. 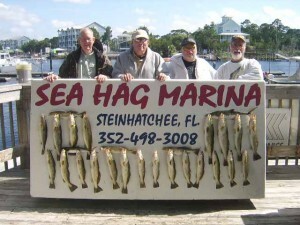 The Sea Hag Ship’s Store has plenty on hand and anything else you may need for your fishing trip. 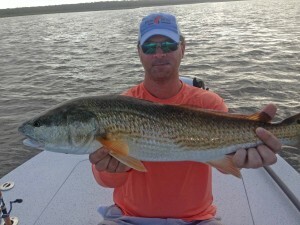 Redfishing has been good also with most being taken on cut bait. Get to your spot early to insure a better opportunity. 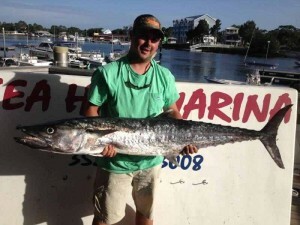 Spanish mackerel, sea bass , and flounder are also biting in varying numbers. If you want something a little larger, tarpon have been showing up in vast numbers; I have seen pods on every outing . Bring the right gear because you will land very few on trout/redfish gear. 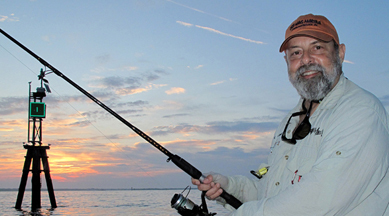 Scallop season is here; the FWC has opened it on the 29th. 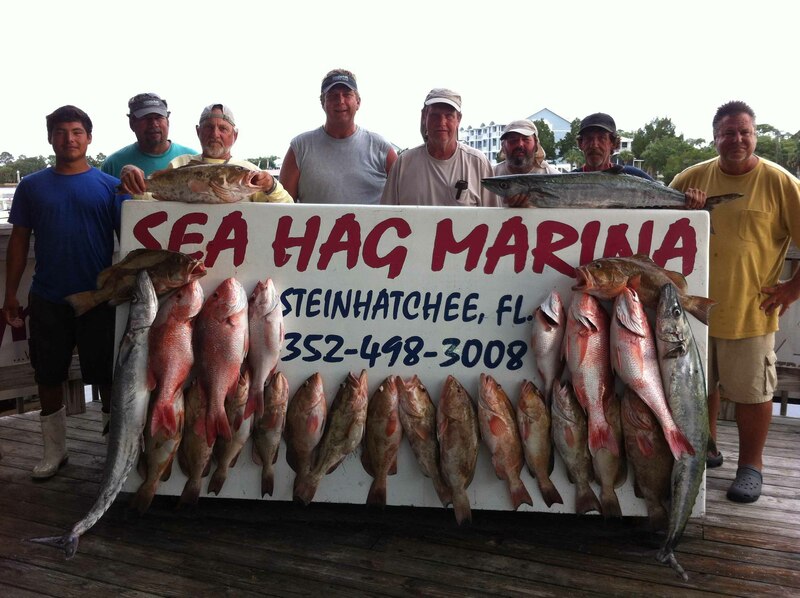 Do not worry if you have forgotten anything for scalloping because the Sea Hag has it all, from fins to snorkels. I will be doing scallop trips this year. 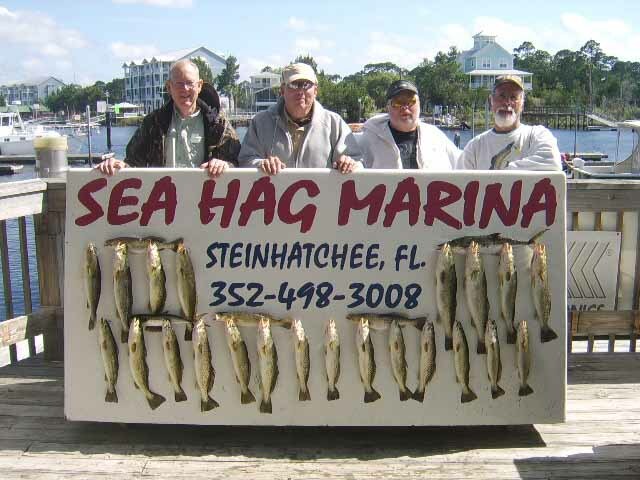 We have a fine group of guides, give one of us a call and we see that you have an enjoyable scalloping adventure. If you want to go it on your own Sea hag has a nice fleet of modern rental boats, they will be happy to set you up. Please remember to be aware of your surroundings while in the water and when idling to your spot, most of all be safe. Despite the challenges that the weather has dealt us in June we managed to find a few calm pretty days to enjoy a solid bite of reds and spotted trout. The warmer temperatures have schooled the reds up and we have enjoyed a number of hook ups of 3 or 4 fish at a time. 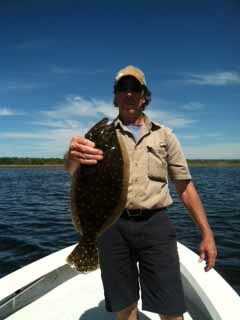 We have also been landing several nice flounder that have ended up as tasty plates of baked stuffed flounder at Fiddler’s Restaurant. 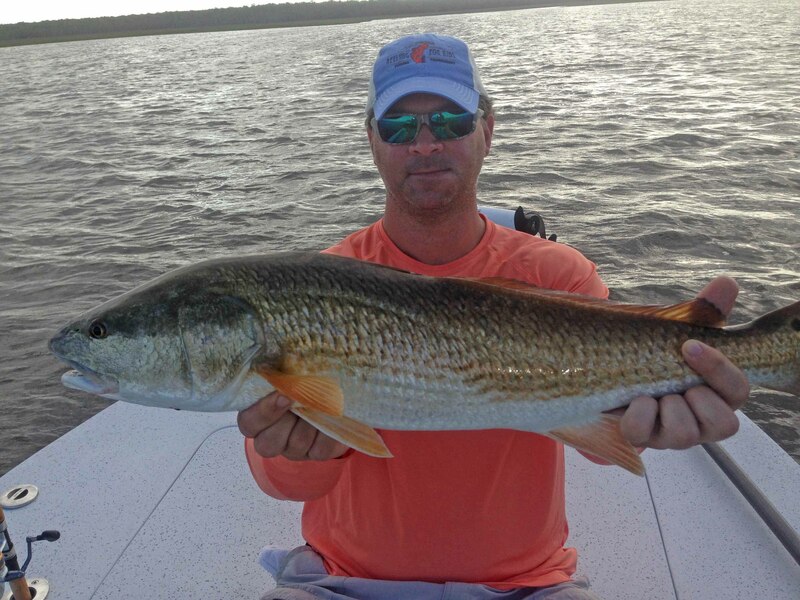 Don’t forget that scallop season has begun, and Hooked on Reds does scallop charters and is anxious to help you get your share of these tasty mollusks. If you go on your own, please follow the rules with respect to dive flags and exercise caution when overboard, as there are hundreds of boats on the water enjoying a great family tradition. 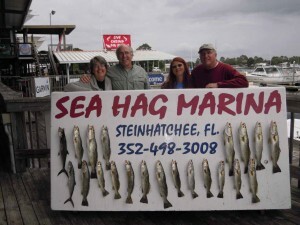 Give us a call; we have some dates available for scalloping, fishing or a combination trip. Yes! 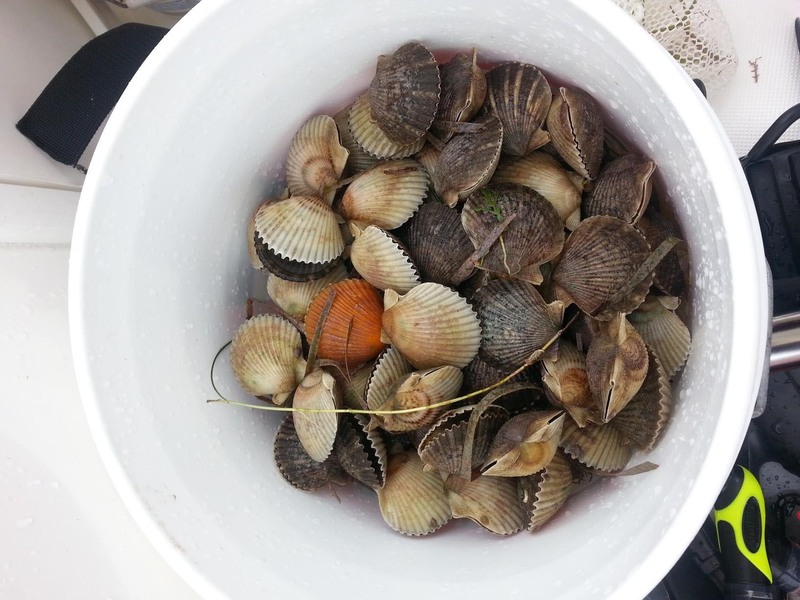 We do scallop trips! 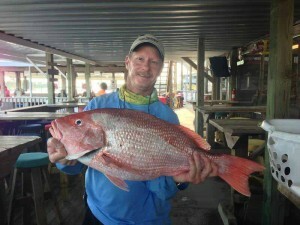 For fast action and a good meat hunt, there is nothing better than yo-yo fishing for Florida snapper (pinkmouth grunts). They bite so well and eat so well there should be a boat flag in their honor. Squid is the sure bait. 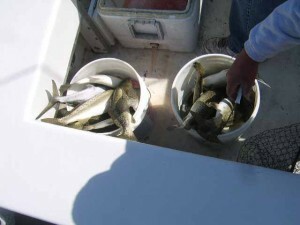 Squid is tough enough to handle multiple fish on the same bait. 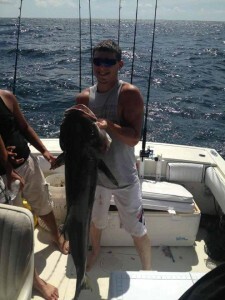 An hour jam of pulling in 30-60 lbs. of good eats in 40-55’ of water is worth the time. 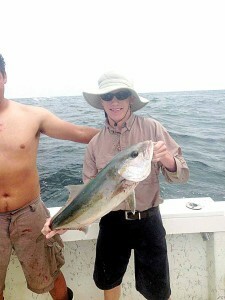 Weather conditions have inhibited rolling well offshore in June. The winds have been more like those of March than June. 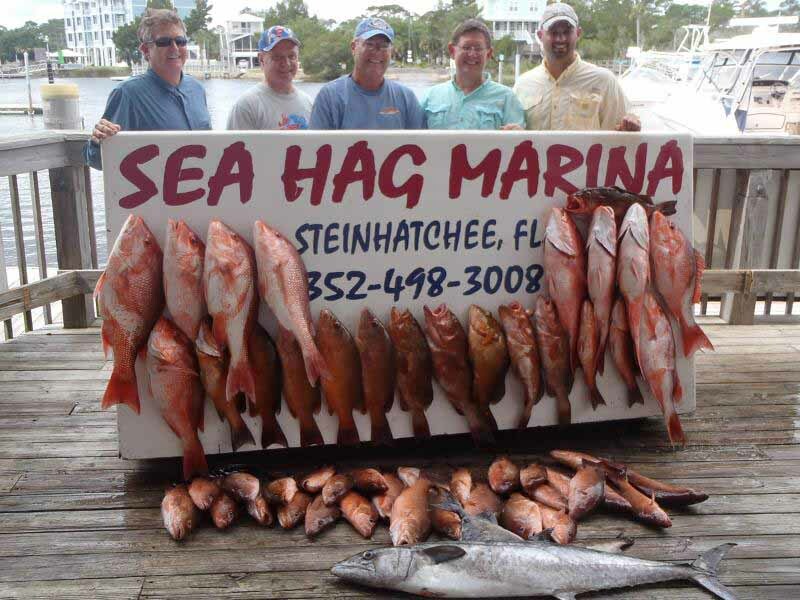 However, water temperature is in the mid 80’s at the moment; I expect seas to settle down in July and boats comfortably free rolling 35 miles plus out for red snapper, red grouper and such during July. 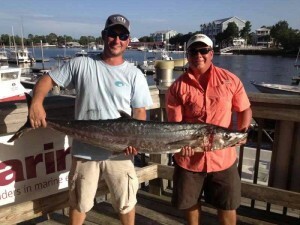 For those wanting to stick near the coast and catch a big fish, kingfish are cruising 20-35’ of water. Troll around the bait pods, cast into the bait pods or anchor amongst the rally and set out free lines. Cobia is what I named my dog because I love the fish so much. Chum the sloughs cutting through the grass flats with free lined live bait and quality fresh caught dead bait on the bottom. Think of it as catfishing for a big’un. 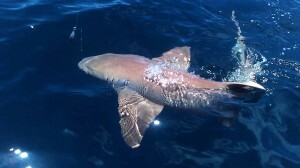 Sharks will help keep the action alive. 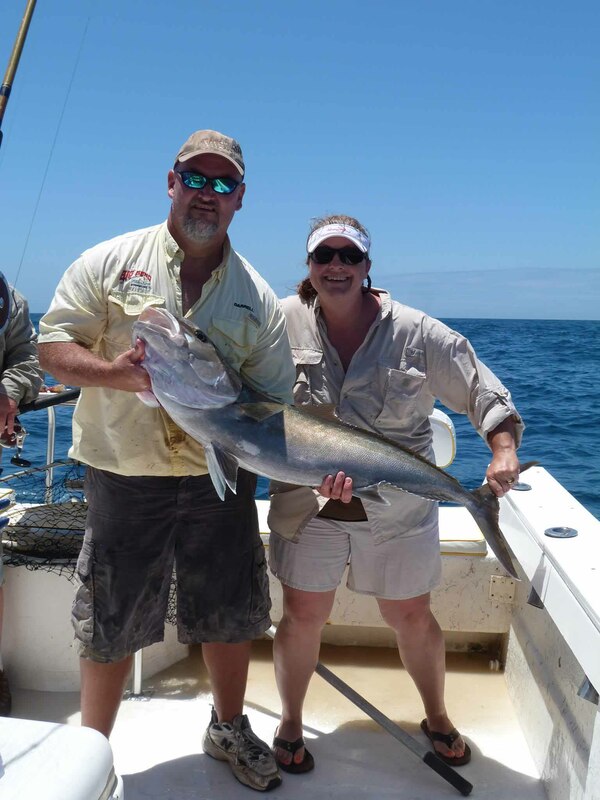 The Greater Amberjack fishing is closed until August 1st. Why? The federal government declared them over fished; yet I can go and hand feed them pinfish from fingertips. 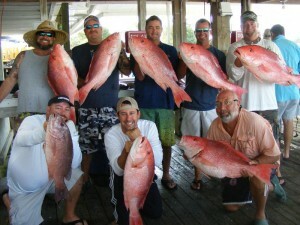 The truth: The feds opened red snapper so they took away amberjack, which are abundant! It’s not a rational agenda. July 1st gag grouper is open. Scallop and fish – makes for a great day, fish early during the coolest part of the day and then return to the flats to cool off in the heat of the afternoon.